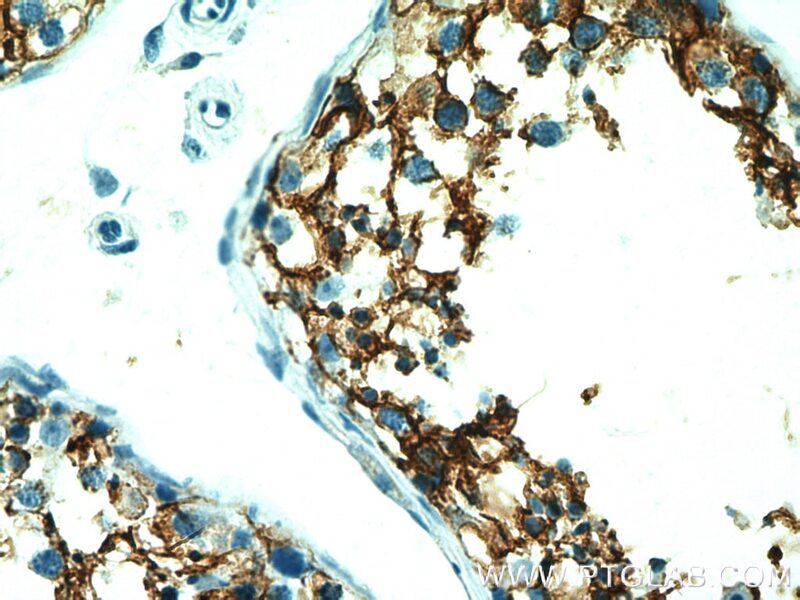 Immunohistochemical analysis of paraffin-embedded human testis tissue slide using 15193-1-AP( CD98 antibody at dilution of 1:5000 (under 10x lens). 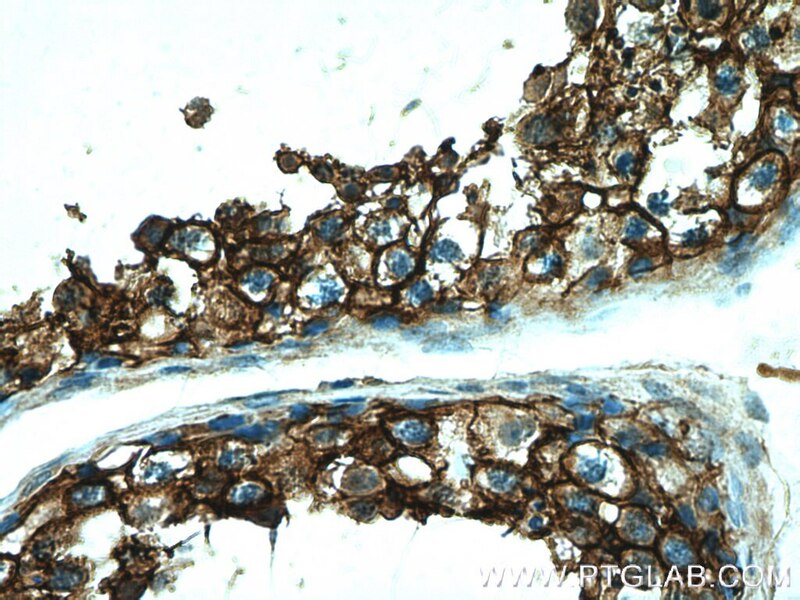 Immunohistochemical analysis of paraffin-embedded human testis tissue slide using 15193-1-AP( CD98 antibody at dilution of 1:5000 (under 40x lens). 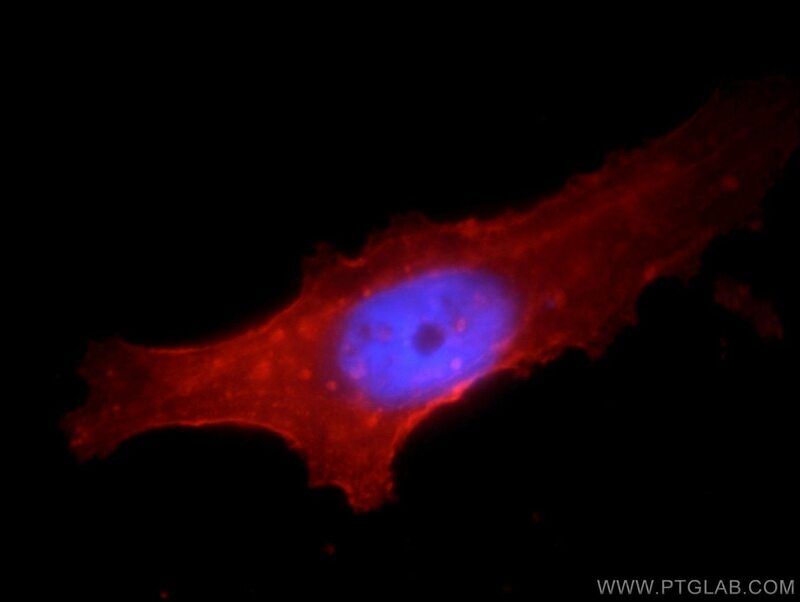 Immunofluorescent analysis of HepG2 cells, using SLC3A2 antibody 15193-1-AP at 1:25 dilution and Rhodamine-labeled goat anti-rabbit IgG (red). Blue pseudocolor = DAPI (fluorescent DNA dye). 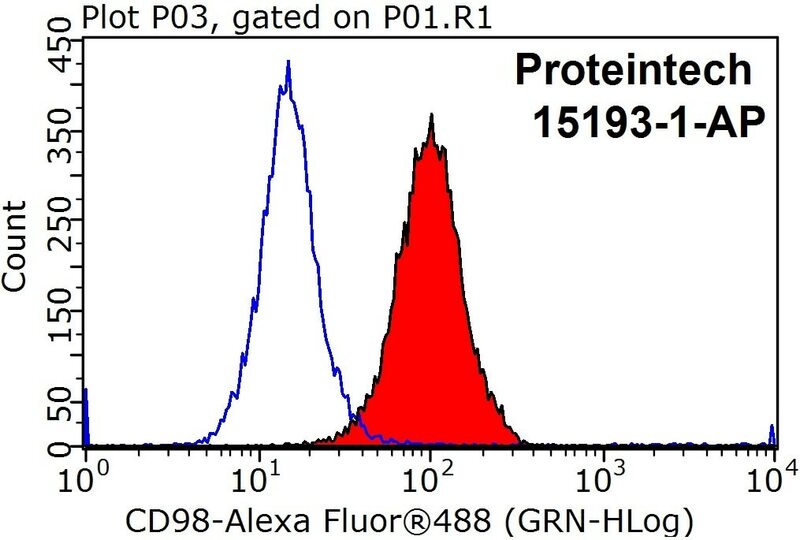 1X10^6 HepG2 cells were stained with .2ug CD98 antibody (15193-1-AP, red) and control antibody (blue). Fixed with 90% MeOH blocked with 3% BSA (30 min). Alexa Fluor 488-conjugated AffiniPure Goat Anti-Rabbit IgG(H+L) with dilution 1:1000. CD98 is a cell-surface heterodimer consisting of a heavy chain (CD98hc) and a light chain. CD98hc also interacts with certain integrin b-subunits to regulate cell migration, survival, proliferation, and adhesion/polarity. 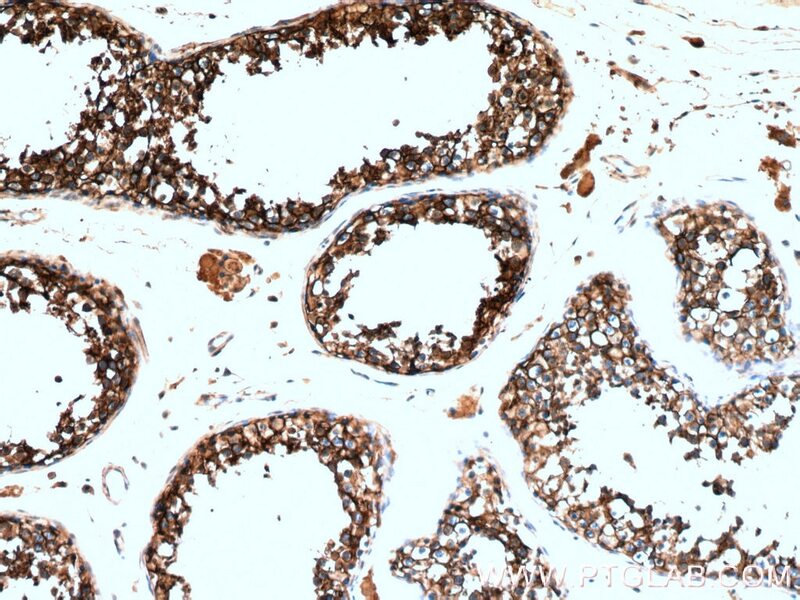 CD98hc is overexpressed on the cell surface of many cancers and increased CD98hc expression is associated with the development and progression of tumors.(PMID:25084765). This protein has 4 isoforms with the molecular mass of 58-71 kDa and can be detected 85-94 kDa due to glycosylation. The glycosylated CD98hc can links to a non-glycosylated light chain (~40 kDa) via a disulfide bond to form a heterodimeric CD98 antigen with molecular mass of 120-130 kDa (PMID: 14770309). 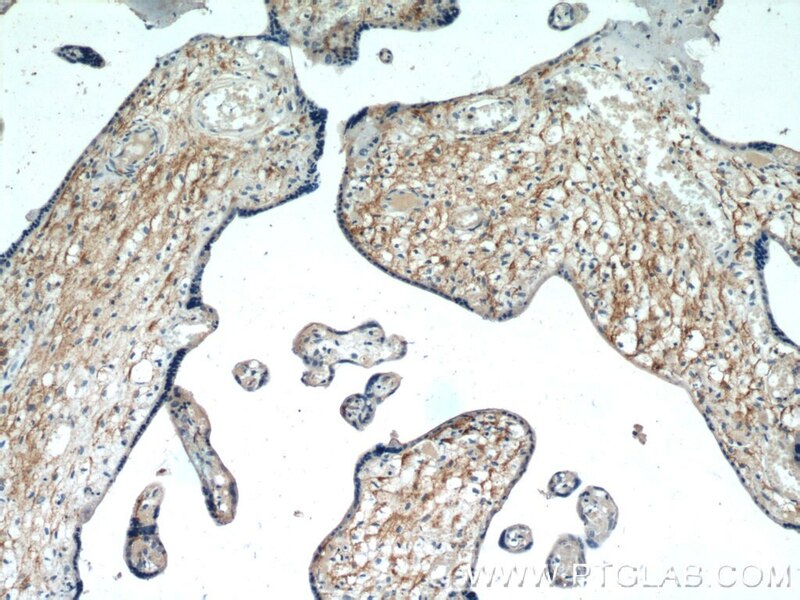 SLC3A2 is upregulated in human osteosarcoma and promotes tumor growth through the PI3K/Akt signaling pathway. CD147-CD98hc Complex Contributes to Poor Prognosis of Non-Small Cell Lung Cancer Patients Through Promoting Cell Proliferation Via the PI3K/Akt Signaling Pathway. Upregulation of CD147 protects hepatocellular carcinoma cell from apoptosis through glycolytic switch via HIF-1 and MCT-4 under hypoxia. Dominant Suppression of β1 Integrin by Ectopic CD98-ICD Inhibits Hepatocellular Carcinoma Progression. 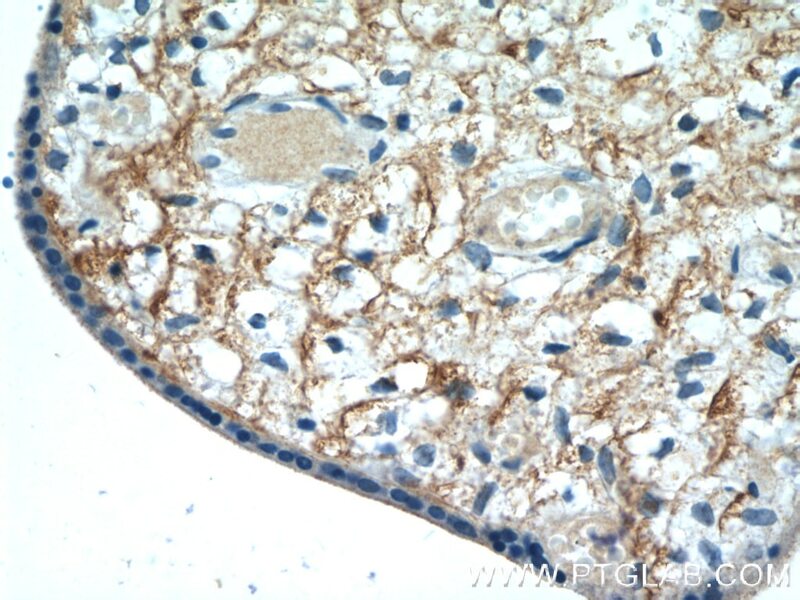 Immunohistochemical analysis of paraffin-embedded human testis tissue slide using 15193-1-AP( CD98 antibody at dilution of 1:200 (under 10x lens). 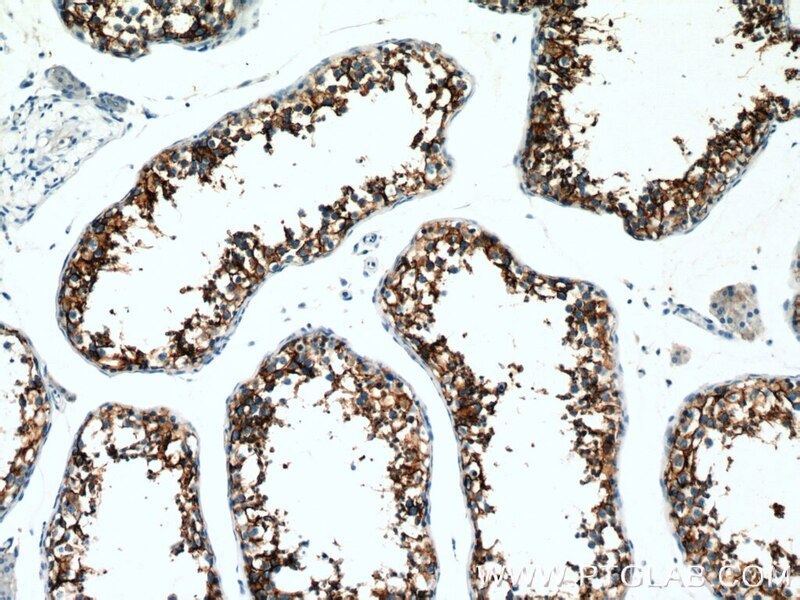 Immunohistochemical analysis of paraffin-embedded human testis tissue slide using 15193-1-AP( CD98 antibody at dilution of 1:200 (under 40x lens).